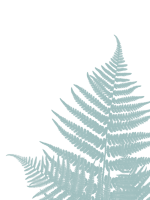 Click on the tabs below to reveal the rich chapters of our history! Many people have founded institutions upon their dreams and philosophies only to find that time and the invasion of others tempered and changed those institutions. 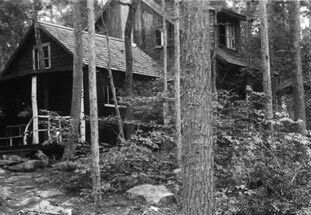 The Rockywold Deephaven Camps are unique in that they have resisted change in the basic philosophies of their founders. To be sure, we are not the same as we were in 1897, when Miss Alice Mable Bacon founded Deephaven, nor as in 1901 when Mrs. Mary Alice Armstrong founded Rockywold. Both of these pioneering women adapted and changed as time went on but held strongly to their basic principles. It is an interesting turn of fate that brought these two strong women together to found and develop this haven of simple life. In their generation there were many women of determined will and purpose, who made their mark, but few who affected the lives of so many generations as have these two. From 1918 to 1961 RDC operated under the careful guidance of Mrs. Armstrong and Mr. & Mrs. Arthur Howe. Buildings went up as needed and improvements were made over the years without incurring a large debt. 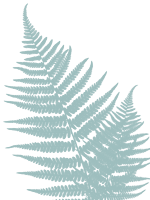 In 1946 the camps were incorporated under NH Law as a family held stock corporation. The next generation at this point were becoming involved not only as directors of the corporation but in the operation of the camps. During the war years Priscilla Howe, Harold’s wife, assisted in the Rockywold office and later Harold worked for several summers helping to install plumbing, some of which still exists. In 1960 Mrs. Howe stepped down as Manager and George Neilson accepted the position. Sydney Howe became President in 1963 followed by Richard Howe in 1970. 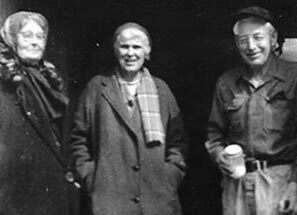 Harold, Alice and Arthur Jr. each served as Vice-presidents. Arthur Howe, Jr. became President in 1973 and has served in that position to this time. Stock was held within the family until the mid 1970’s when a few shares were sold to a long time guest. Since that time, shares have continued to be divested. By 1984, 20% of the stock was owned by guests; guests who believed in what RDC stood for and wanted to insure its preservation. The value of the stock has more than doubled in the last ten years. Many family owned resorts built at the turn of the century have disappeared because the next generation had other interests. RDC is fortunate in this respect and also in that it has adapted and adjusted to the changing times. The diversity of ownership is a big step in preserving this stable dynamic institution. The first manager, George Neilson, took on the difficult task of conversion to management by someone outside the family. His skills carried it through and he left in 1967 to go back to secondary education. William Jensen, formerly a Lutheran minister, took over from Mr. Neilson and guided the camps during a 14 year period of expanding numbers of guests staying for shorter periods of time than had been traditional. Also there was more rapid turnover of summer staff, all of which added complexity to Camp administration. On his retirement in 1981 Franklin Perkins, Jr. was hired to replace him. There is much that has only been touched upon and still more that has not been mentioned to make this a complete history. This is the author’s effort to pull together some of the major strands and facts that make up the fabric of RDC. Many individuals and families outside the Bacon, Armstrong and Howe families, however, have contributed a great deal to the success of RDC as one of the finest New Hampshire Resorts. Deephaven is the inspiration of Miss Alice Mable Bacon, teacher, author, philanthropist, patriot, and Christian. She was the daughter of Dr. Leonard Bacon, Pastor of the First Church, New Haven, Connecticut, writer, and a leader in the antislavery movement. Her family also had a deep interest in the Japanese people and one of Miss Bacon’s early companions was a Japanese girl who lived with them while being educated. This interest lasted throughout Miss Bacon’s life and resulted in her writing several books on Japanese women. Evidence of the Japanese influence may be seen in Deephaven cottages in the many sliding doors and the bell tower. A large Japanese gong announced the serving of meals and is still in camp. As a child Miss Bacon had spent a year with her family at Hampton Institute in Hampton, Virginia. This was one of the first colleges for blacks and American Indians. It was founded by General Samuel Chapman Armstrong in 1867 while he was working for the Freedman’s Bureau after the Civil War. He had been commander of a regiment of black troops in the war and was the son of missionaries in Hawaii. In 1883 Miss Bacon returned to Hampton as a teacher, not only in economics and civics but also in Theology, for which she was the entire department. Her originality and sense of humor made her classes a constant delight. Her realization of a need for black nurses resulted in the establishment of a nursing school and hospital at Hampton. Miss Bacon was introduced to Asquam Lake by General Armstrong. The General had visited Boston while fund raising for Hampton in the 80’s and through friends had come to the lake to rest and fish. 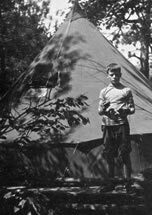 He had a keen interest in the work of Henry Balch, who started the first boys camp in America on Chocorua Island (now Church Island) in 1881 and stayed there when he came to the lake. Miss Bacon spent the summer of 1896 at the pioneer Pinehurst Camp just east of the present Deephaven land. This was owned by Rev. H.B. Frissell, Chaplain and later President of Hampton Institute. This experience suggested another project to Miss Bacon, a place where people who lived intensely during the winter could come for a summer vacation in an atmosphere of the simplest and most basic nature. 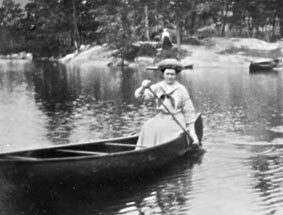 The story goes that one day as she was canoeing, a stiff wind came up, and she sought the protection of a deep cove. Here, she said, is where I want my camp, and before she left that summer, she had purchased the land for Deephaven. With her that summer was the widow of General Armstrong, Mary Alice, who was also a teacher at Hampton. 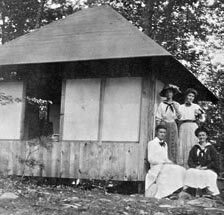 In June of 1897 Deephaven Camps was opened on a business basis, but it was expected that it would only pay expenses. 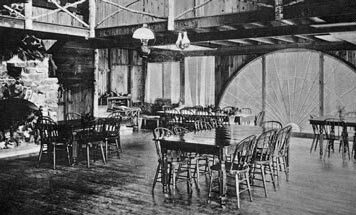 The original Longhouse, destroyed by fire in 1907, and the kitchen and dining room with tent roof were the only buildings ready for use. The living room of Brown Betty was built that summer as a cottage. The dining room was between the Longhouse and where Point of View now stands. It later burned and was rebuilt on its present site. From the beginning the camp was filled, and among the guests there were, as ever since, men and women well known in university and literary circles and in public life. Miss Bacon had a special faculty for interesting everybody in work for the common good. Campers dug up rocks to make better paths and cut underbrush and wood for the fires. Whatever was to be done, there were always ready hands, hearts, and brains to do it. Housing in these early days was in tents along the easterly Deephaven shore. Platforms were built to erect them on, and since there was no plumbing, outhouses were stationed at convenient locations. These hardy folks thrived on this new environment and turned their efforts from brain power to manual labor. The hammer and saw were put to good use as refinements and additions to tents and cottages were undertaken. As families gathered they asked Miss Bacon if they could build their own cottages, and many did. We see today cottages named for these families: Rusch, Birdsall, Porter’s Lodge, Maurer, Park, Ewing and Buffum. An architect at Yale developed the Fisher Hut , which was an improvement on the tent. It had a shingled roof, one room with sliding paneled walls of unbleached muslin, and a porch. With kerosene lamps on at night, the thin muslin presented an interesting shadow display for passers by. These structures form the foundation for many of the cottages today. According to the taste and desires of the occupant, they were added to in every direction, sometimes several times. 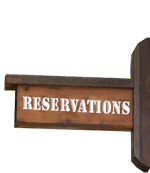 In either camp you will not find two cottages alike. Miss Bacon brought with her several of the black students from Hampton to help in the kitchen and dining room. In this way they earned their tuition. As the camp grew, more help was needed, and there were plenty of students and professors eager to come north to help Miss Bacon. At one point it was said there were as many degrees in the kitchen as there were amongst the guests. This situation held true for both camps until the early ’60’s. On Saturday and Sunday nights the Hampton people sang spirituals on the Longhouse steps. Saturday there were frivolous songs, but Sunday they were strictly spiritual. Porcia, the cook, was their leader, and her voice could be heard soaring above the others. Campers used to drift out front in their canoes to listen to the music. The group gave concerts for the general public in the surrounding towns and were much appreciated. Many of the key staff members for Miss Bacon and Mrs. Armstrong returned for 25 to 40 years. In 1900 Miss Bacon wanted to return to Japan to teach for two years. She asked Mrs. Mary Alice Armstrong to run the camp in her absence. Miss Bacon saw in this young widow with two children many of her qualities and dreams. 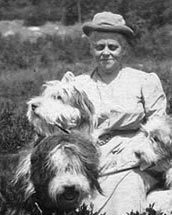 How right she was, for in 1901 Mrs. Armstrong bought the adjacent land to start her own camp, Rockywold. The two camps existed side by side but under separate management for sixteen years. We might think of Holderness back at the turn of the century as an isolated farming community. It was, however, in addition to that a bustling summer community with Lake Asquam and the mountains as the attraction from the heat of the cities to the south. The Asquam House atop Shepards Hill and the Mount Livermore on the lake shore at Livermore Cove were two flourishing hotels. Both of these succumbed to that ever present danger, fire. Train service to Ashland on the Boston and Maine was excellent, and connections could be made for Boston and New York. You arrived amid cinders met by a horse drawn carriage that took you to the docks of the Asquam Transportation Company on the river just outside of Ashland. There you made your way up the lakes to Deephaven in one of the two passenger steamboats which plied the lake daily between Ashland and Sandwich Landing. These coal burning ships moved on a regular schedule of four trips a day. The S.S. Holcyon had a hinged smokestack that lowered to get under the Holderness bridge. 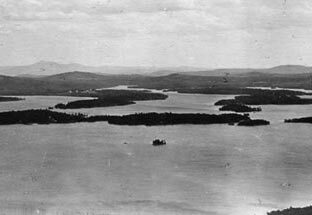 The S.S. Chocorua was the other passenger vessel. On the way the boats would stop at various docks to deliver mail and supplies, and more than a few pleasantries were exchanged in the process. The Deephaven dock was at the present site, and the mail was distributed from the Studio . The arrival of the steamer was a big event, and many congregated on the dock to await it. 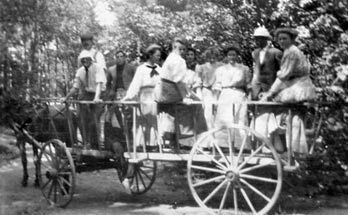 In 1904 the camp supplied horse drawn transportation to town. The records show Surry to Ashland, $3.00, Buckboard to Holderness, $1.50 . Miss Bacon went to Holderness in her buggy shopping each week, and it took all day. Everyone put in their orders, said farewell when she left and were there to greet her on her return. The Nellie J was a floating store and stopped at the Deephaven dock twice a week. Aboard were fruit, cookies, soda, candy, etc. to keep these active people going. Tennis courts were installed at the Playhouse around 1908 but until then the lake and mountains supplied most of the recreation. 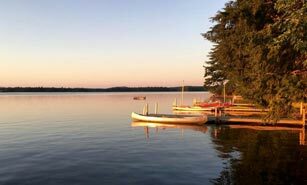 Motorboats were almost unknown, and so it was with paddle, oar and sail that people made their way about these unique New Hampshire Resorts. 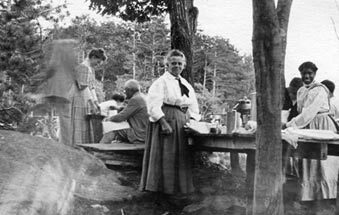 Every Saturday night a picnic supper was served across the Bight on Needle Point followed by Miss Bacon’s reading of contributions to the camp paper, The Barque and Bight. There was prose and poetry, good and bad, from the literary worthy and unworthy. A bag hung on the office door into which contributors put their offerings, and after the feast Miss Bacon would bring forth the literary harvest of the week. She must have made an impressive sight standing by the fire reading from its light. To end the evening, campers joined the Hampton boys and girls to sing: The shadows deepen, quiet reigns, Camp calls us o’re the Bight; The flicker of the campfire wanes, it’s time to say goodnight. Rest safe in old Deephaven’s arms, goodnight ye campers all. Closely allied to Miss Bacon’s thought of the satisfying beauty of Deephaven and the simplicity of dress and life, was her wish that friendliness should be an outstanding feature of the camp; that camaraderie should be linked with her other ideals. 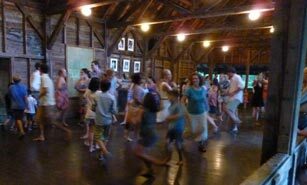 So she encouraged the gatherings in the Longhouse living room, where charades, talent shows, and talks helped in her get-together plan. 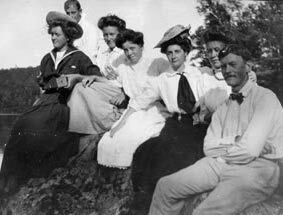 Church on Church Island and evening Vespers on Flagstaff Point were always well attended. Another, and perhaps the deepest thought of all, led Miss Bacon far from the give and take of business. Sitting before the open fire of one of her campers in 1917, she talked over with great interest the approaching summer, that summer she never reached, and said, My camp is me, and I think of it with its beauty and rational life as one of the most worthwhile things I have ever done; as something beautiful and helpful which I hold out in my hand to those who would care to take it. Mary Alice Ford was born in 1864 on her father’s farm in Lisbon, New Hampshire, the daughter of Samuel Perham and Jane Kelsea Ford. Her childhood was spent in Lisbon where she attended school. In early 1880 she graduated from Plymouth Normal School as a teacher. Her first teaching assignment was in Centre Harbor and then in the Blue Schoolhouse near Sugar Hill. Through friends she heard of the Hampton Institute in Hampton, Virginia and became interested in the plight of the newly freed slaves. 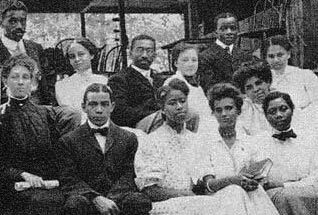 She accepted a teaching position at Hampton in 1884. This was quite a decision for a girl of 21, who had hardly left her home town, but it is indicative of her personality, drive and commitment to a cause. Following a year’s leave of absence from Hampton for study at the University of Michigan, Mary Alice returned to Hampton to resume her duties. The following year, September 10, 1890, she married General Samuel Chapman Armstrong, President of Hampton, at the home of her cousin, Mrs. Martha Scoville in Montpelier, Vermont. Rev. G.W. Gallagher, pastor of the First Congregational Church, was assisted in the ceremony by Rev. H.P. Frissell, Chaplain of Hampton. At Rev. Frissell’s invitation, General and Mrs. Armstrong spent their honeymoon at Pinehurst Camps on the shores of Asquam just east of what was to become Deephaven. Rev. 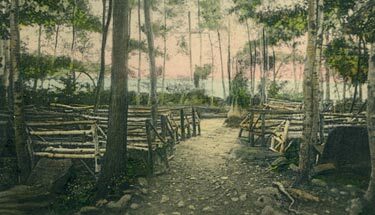 Frissell owned this early camp that was later purchased by Mr. C.C. Morris, who eventually owned all the land east of Deephaven through the Five Finger Points. 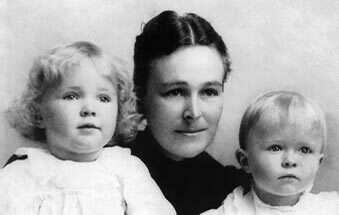 General Armstrong died in 1893 and left Mary Alice with two children, Margaret and Daniel. She continued to teach at Hampton until 1904. Miss Bacon invited her to come to Deephaven in 1900, and she and the children built their own cabin, now part of Brown Betty. 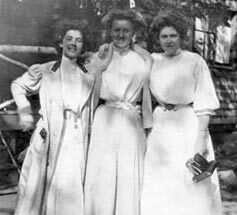 In 1900 Miss Bacon returned to Japan and asked Mrs. Armstrong to manage the camp for two years. This experience proved to her that this was what she wanted to do. In 1901 Mrs. Armstrong bought 27 acres of land adjacent to Deephaven and began her own operation. 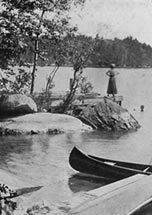 In 1902 Rockywold was opened with two cottages, a dining room and a few tents along the shore as one of the first New Hampshire resorts. Both camps flourished as word spread. Friends brought friends, and so it has gone into the third and fourth generation. From Virginia to Philadelphia and on up the coast until now there are guests from coast to coast and beyond. The outstanding characteristic of the camps is they are a place for simple and wholesome family life with freedom from domestic cares. This has made it possible for families to do things together. 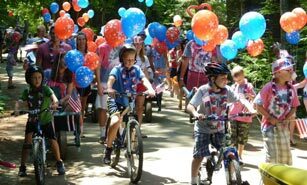 Family reunions have been a great attraction, and activities for all ages make it an ideal environment. Old traditions are still important and meaningful. Church on Church Island, Vespers at Flagstaff Point, the square dance, talent shows, and all camp cookouts still get everybody together to share and enjoy the lake and its surroundings. Mrs. Armstrong abstained from alcoholic beverages of any kind and expected her guests do likewise. 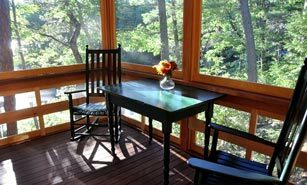 We still do not serve drinks in our dining room, but guests are free to do so in the cottages. The latter was not so in Mrs. Armstrong’s day however; it is said that at the limit of throwing distance off a number of RDC docks, there is quite a collection of old bottles. There are no rules at Rockywold, but if you disobey them, you may not be asked back. If you did not receive a Christmas card, perhaps there would be no room for you that year. At leaving one day a guest saying good-bye to Mrs. Armstrong said, God willing I will return next year. Mrs. Armstrong replied, not too loudly, And doesn’t she know how little God has to do with it? Both Miss Bacon and Mrs. Armstrong bought adjacent land for protection and for the use of their guests, adding cottages to meet demands. The Camps made an impact on the lake and surrounding area, and for the most part it has been favorable as. The guests were interested in nature and in preserving the natural beauty they found here. Many guests purchased property around the lake and built their own cottages. 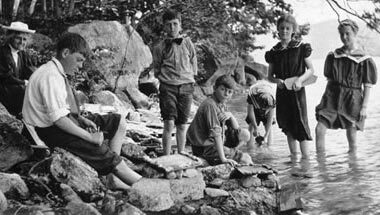 These people today form a large part of the lake community along with other New Hampshire resorts and continue to exert their influence on preservation of the area. From the early days of both camps, guests came and spent the entire summer. This long association forged a strong community bond and there was a more relaxed approach to the vacation. A rainy day once in a while was a welcomed respite to read and visit. 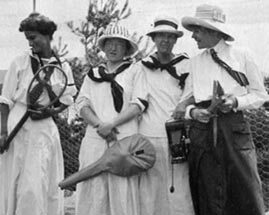 By the early 1930’s there was increasingly a July group and an August group as vacation styles changed. Time off was taken in the winter as these resorts became more popular. After the second World War, these two groups were eroded into those who came the first two weeks and the last two weeks of each month. Campers now stay for a week or two but still come at the same time each year. While these changes have altered the intimacy, the congeniality, and the sense of community at RDC, these elements have not been destroyed. They continue to flourish in different ways partly because the general routine remains the same and partly because of the lake and mountains. There is, however, the feeling that there are only seven days and we must do everything. A rainy day now is not the relief it once was. Many Campers who came here as children are seeing their grandchildren take advantage of what RDC has to offer; to make lasting friends, to love and appreciate nature and its beauty. As one of the most unique and fascinating New Hampshire resorts, RDC offers an amazing vacation opportunity. In those early days, as still today, there were local residents who worked at the Camps year round. They concentrated on maintenance, repairs and the building of the cottages. Deacon Haskell, the legendary one-armed carpenter, built many of the early cottages. He was replaced by Tom Sommers who with his wife performed many services. Tom served as farm manager when fresh vegetables were grown as well as purchasing agent, plumber and mechanic. Colby Lyford was involved with the construction of the later cottages and worked closely with Mrs. Armstrong. 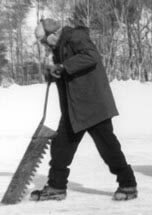 His son, Norman, still works on the camp buildings and replaced his father at the ice saw. Miss Alice Main of Ashland was Mrs. Armstrong’s bookkeeper and secretary for many years. Paul Needham succeeded Tom Sommers and had as his assistants Robert Howe and William Zimmer who continue today to care for the buildings, boats, plumbing, vehicles, as well as handling the icing and syruping. These loyal people were a great help to Mrs. Armstrong and later Mrs. Howe, in the development and preservation of the physical plant. The opening of Rockywold gave more opportunities to students at Hampton and the community grew as both camps expanded. It was considered a privilege to come to work here though much was expected. The students had a song they used to sing about Mrs. Armstrong: Here’s the little widow coming on the run, never let her catch you with your work undone. She was strict but fair in all her dealings and somehow managed to make each one feel as if they were part owner and therefore responsible for the smooth running of the camp. A guest once told her Rockywold runs like a French clock, you can see it run but you can’t hear it tick. The RDC experience had a profound effect on the lives of many black students. They found here people who were interested in them, who were fair in their dealings, and who appreciated what they had to offer. Mrs. Armstrong followed closely the educational careers of these young people. Once when parting, a guest said good-bye in Latin. In the car on the way to town the guests could not understand what he had said. The driver of the car translated for them. A close group of Hampton people were key employees for Mrs. Armstrong for over two generations. Names like: Joshua Baldwin, Howard Cann, Robert and John Smith, Harold Ball, Lena White, Lucy Lee Jones, Clara Scott, and Ruth Thompson. 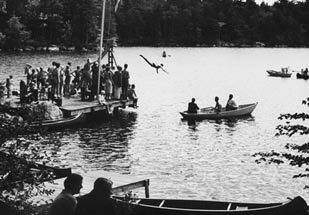 These and many more, faithfully served the Camps through the first fifty years of existence as one of the first New Hampshire resorts. The summer staff was all black until the early sixties. Following the Brown vs. school board case and the integration of public elementary and secondary schools across America, the management of the Camps became increasingly uncomfortable with the image of a totally black work force and a totally white guest clientele. The time had come for change. Each year cottages replaced tents until, as today, 61 cottages and two lodges spread along the lake shore at respectful distances from each other. Electricity replaced the lantern, plumbing replaced the backhouse, and hot water replaced the bath in the lake. More subtle changes are still taking place today to make things a bit easier and yet not change the basic character of the camps. Comfortable rustic seems a fitting description and makes RDC unique out of all of the New Hampshire resorts. One custom that has held through the years is the cutting of ice from the lake. Two hundred tons are cut and stored in ice houses in each camp. Ice boxes in the cottages hold the ice for guests. This harvesting takes a crew of 7 a week to accomplish and is still an economical solution for the production of ice. The camp kitchens, which once used blocks of ice to preserve food are now served by modern refrigeration. In the spring, steam still rises from the sugarhouse as the sap is boiled down to maple syrup. Two to three hundred gallons are made to sell to guests each year. It takes 40 gallons of sap to make one gallon of syrup. A fire destroyed the Rockywold dining room in 1932 and in 1959 a brush fire swept into the center of the same camp and razed the laundry, 3 men’s dorms, the icehouse and the pumphouse. In RDC style adjustments were made and Camps opened as usual. 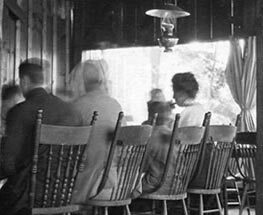 For one summer all the guests crowded into the Deephaven dining room. 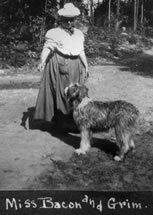 Mrs. Howe was born in Hampton, Virginia in 1891, and from 1897 on she spent most of her summers at Rockywold Deephaven. She graduated from Vassar College, the class of 1914 and in 1916 she and Mr. Arthur Howe, whom she met while he was attending Yale, were married on Church Island. Through the years they lived successfully at Loomis and Taft Schools and at Dartmouth where Mr. Howe taught for three years. From 1930 to 1940 Mr. Howe, then a Presbyterian minister, served as President of Hampton Institute, the same institution founded by Mrs. Howe’s father, General Armstrong. 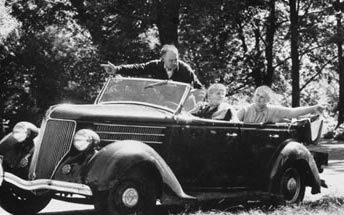 The Howes had five children, Alice, Harold, Arthur Jr., Richard and Sydney and they spent many happy summers at the Camps. 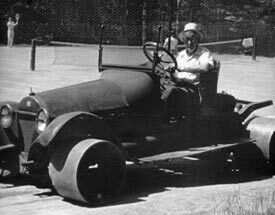 In 1949 Mrs. Armstrong was finding it difficult to carry on the large responsibility of running the Camps. At this time Mr. Howe retired, he and his wife moved to Plymouth, NH. He became the President of the Camps and Mrs. Howe, General Manager. Mrs. Howe continued in this responsibility after the death of her husband in 1955 until her retirement in 1961. Mrs. Armstrong passed away October 19, 1950. It must have been like coming home again to Mrs. Howe who had spent so much of her life here. It was a great opportunity to be able to spend her later years carrying on and further refining the work of her mother. 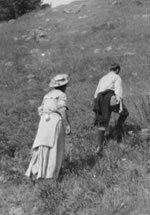 Mrs. Howe was deeply interested in preserving the natural beauty of the area and was an avid mountain climber. Through her influence a major portion of the land on Rattlesnake Mountains belonging to RDC was given to the University of New Hampshire along with land owned by Frank Webster and C.C. Morris. This land was preserved in perpetuity as a natural area for the use by the public and the Forestry Department of the University. She worked closely with Mr. C.C. Morris to encourage his adding the summit of East Rattlesnake and the Five Finger Points to the preserve. 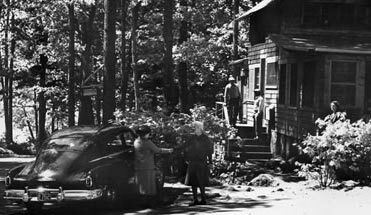 She was also active in the founding of the Squam Lakes Science Center and the affairs of the Squam Lakes Association and the Plymouth Hospital. It was her concern that RDC with its influx of people during the summer not spoil this special place.